Kumar Gaurav 2 years, 6 months ago. Here is the much awaited Nougat 7.0 ROM for Moto G CyanogenMod 14 (CM14). In addition this we also have the Lineage 14.1 for Moto G (falcon). For latest updates, stay tuned to the Lineage OS device list page. Since Google released Android Nougat Source code, we have update many Android NOUGAT AOSP ROMs and we also have CM14/CyanogenMod 14 Nougat 7.0 ROMs for many devices updated and many are yet to come. 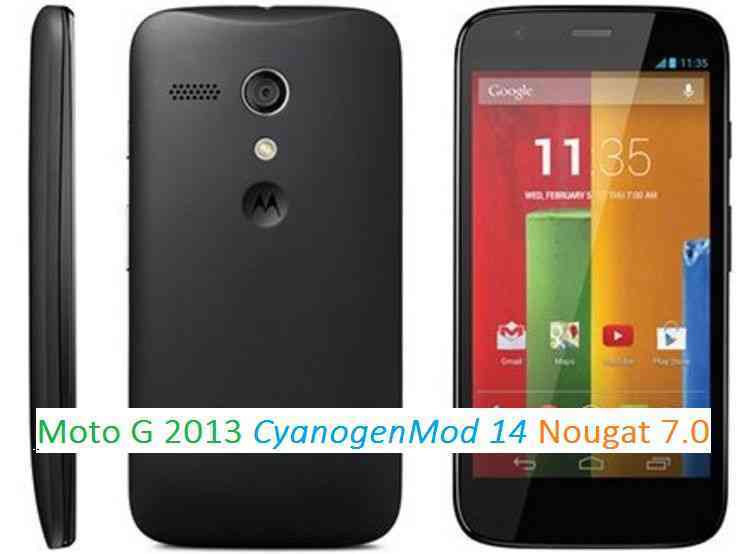 This Moto G for CyanogenMod 14 is brought to you by developer Eurofighter_ty. Installing a custom ROM on a the Moto G may require the bootloader to be unlocked on Moto G and a Custom Recovery on Moto G, which may VOID your warranty and may delete all your data. Before proceeding further you may consider backup all data on the phone. You are the only person doing changes to your phone and I cannot be held responsible for the mistakes done by you. Download and Copy the Nougat GApps and CyanogenMod 14 Nougat ROM ZIP to Moto G.
First flash the Moto G CM14 ROM ZIP from device. Reboot and Enjoy the CyanogenMod 14 Nougat ROM on Moto G.
Stay tuned or Subscribe to the Moto G 2013 forum For other Android Nougat ROMs, CyanogenMod 14 ROMs, other ROMs and all other device specific topics. The development thread for Moto G CM14 ROM is here. I have a question, what is the app called “hid”? I am able to successfully install CM14 on my Moto G. But I am no longer able to authorize my device for debugging on my PC. The authorization pop up never shows up. I went through many links, But nothing worked for me. As I know it is still unstable version, So that is quiet expected some issue. Would you guys please check once ? USB Debugging mode is enabled already. And device is listed as unauthorized device when I fire command adb devices.